Since both of us have never been there before, originally, Buddha Boy wanted to take me to Cheesecake Factory for dinner on our first night in Bellevue. But after we carefully "studied" the menu, there's really not much I could eat due to my dietary restrictions. 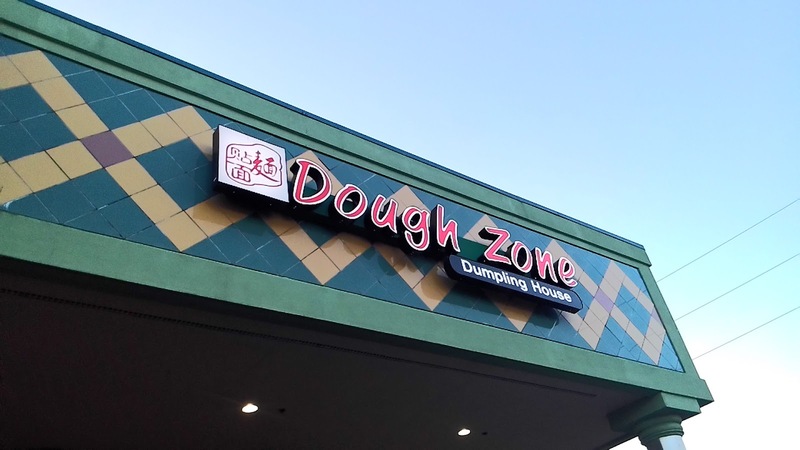 Buddha Boy started looking online for alternatives and we ended up at Dough Zone Dumpling House 麵貼面 for some xiao-long-bao. 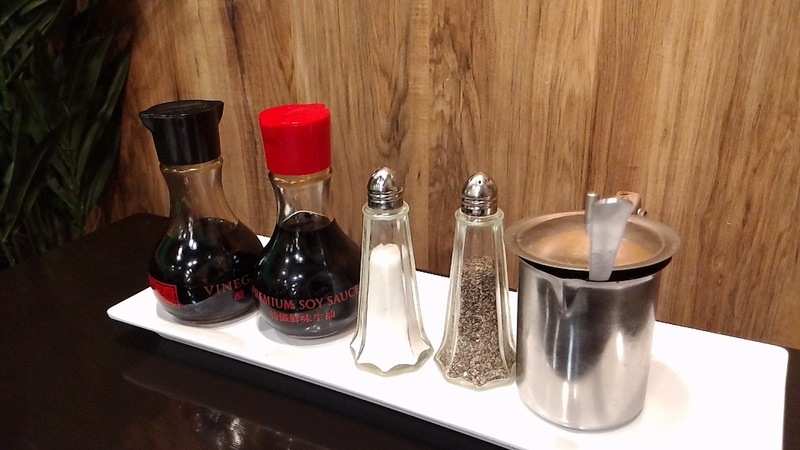 We went to the location on NE 24th Street in Bellevue. 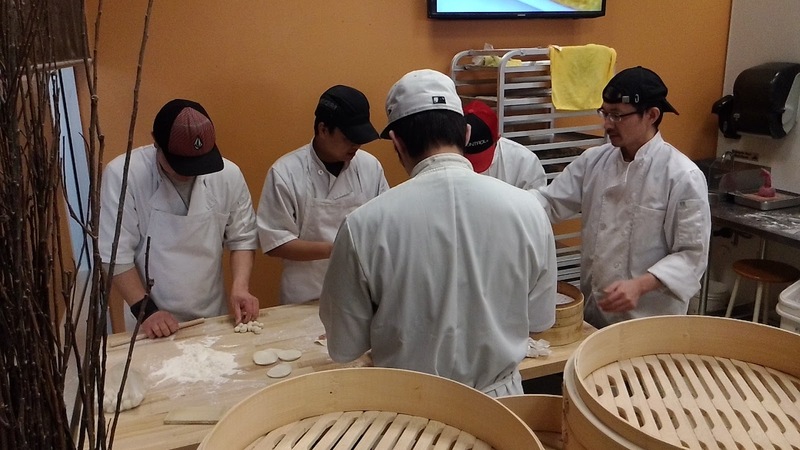 Similar to a lot of XLB joints, there's an open kitchen that showcase the making of buns and dumplings. We're not sure if this restaurant chain is Taiwanese-owned or Chinese-owned, but after reading through the menu, we're leaning towards the latter, simply because the use of simplified Chinese texts and how the menu items are listed in very specific Mainland-Chinese localism. 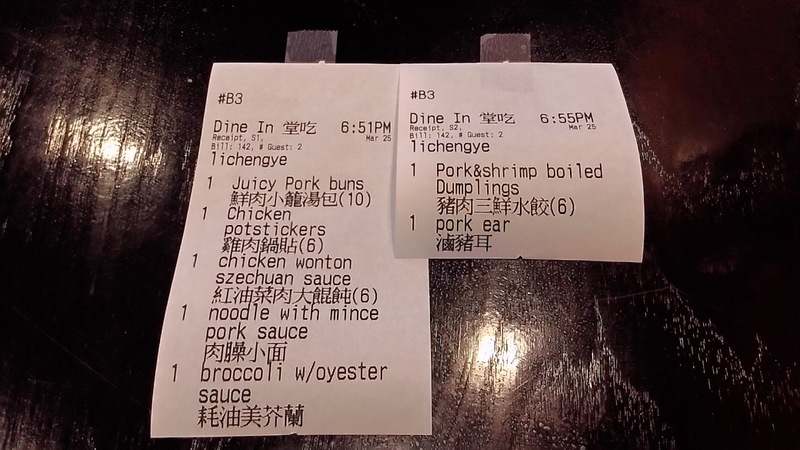 At $9.50USD, this order of Juicy Pork Buns 鲜肉小笼汤包 was a bit pricey. 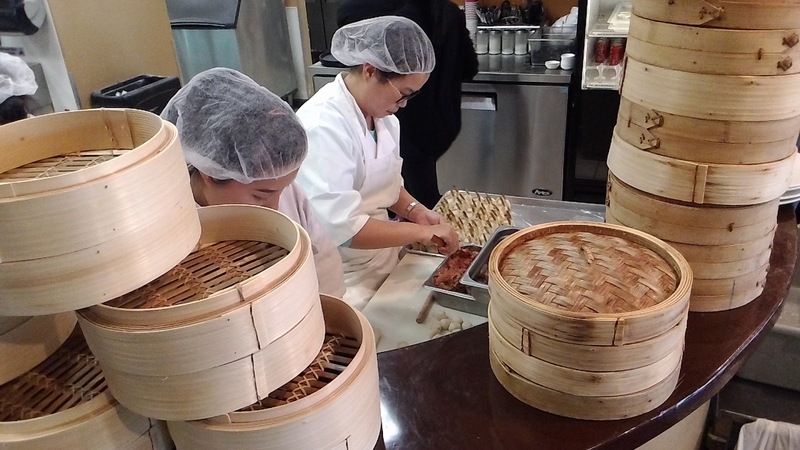 The order came with ten systematically folded XLBs that were rushed to the bamboo steamer for steaming. The delicate yet sturdy skin wraps had chewy Q-texture that tightly kept all the juicy liquids inside the buns. Each mini bun had a good amount of soup that was not greasy. The meat was a bit gritty with a gingery taste that slightly overpowered the scallions. These buns were much, much, much better than the ones at Din Tai Fung 鼎泰豐 in Bellevue. For those who never tried the true DTF in Taiwan (especially at its "original" outlet), the one in Bellevue is just incomparable. Don't waste your hard earned $$$. P.S. 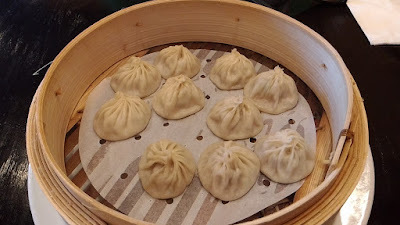 FYI, in recent years, DTF is only ranked #2 in Taiwan for its famous XLB. After some good gyozas from the ramen joint earlier, Buddha Boy and I craved for more. 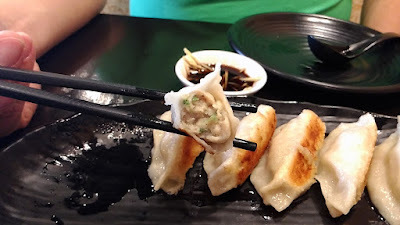 The Chicken Potstickers 鸡肉锅贴 did not disappoint us. The thin and springy flour-dough wraps kept its tight physique through the courses of pan-steaming and pan-frying. 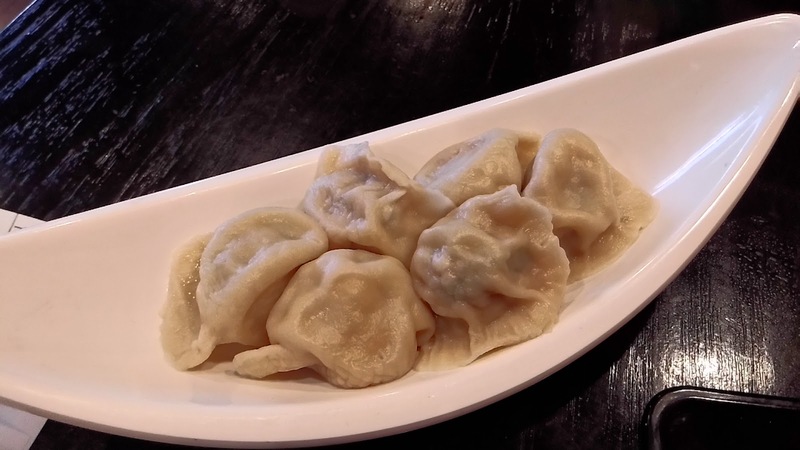 The dumpling bottoms had that gentle and delightful crisp. The chicken and napa cabbage stuffing was lightly seasoned with salt. Because there was no excessive moisture or liquid extracted from the cabbage, the filling maintained its textural crunch and the pudgy dumplings kept its sturdy build. Buddha Boy, being a Cantonese-descendant, never liked Shanghai-style wontons, and I haven't been able to find anything good, locally in 604, to change his mind. 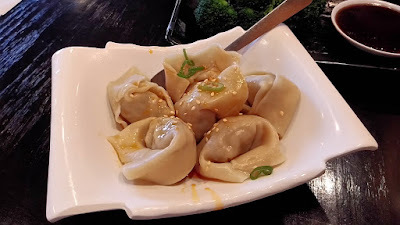 However, that all changed when we encountered these Chicken Wontons in Szechuan Sauce 红油鸡肉抄手. Similar to the potstickers, the mildly seasoned meat stuffing kept its firm frame inside each light and chewy flour-dough skin wrap because there were no unnecessary wetness that would result in a floppy figure. 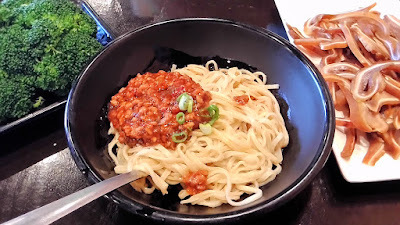 Buddha Boy has already done his homework and knew that he wanted the Noodle with Minced Pork Sauce 肉燥小面. Being a northern Chinese-descendant, I'm extremely picky when it comes to noodles or any type of flour-dough products. I admit, I'm never a fan of thin noodles because I often find it too soft or lacked chewiness. However, here at Dough Zone, I object all that opinions. The thin noodles used here were stretchy with a ravishing Q-texture. The noodles had that aromatic hint of flour sweetness that aren't often found in many places. Instead of being the star with a carb sidekick, the sauce became the accompaniment to the noodles. The thick and meaty pork sauce had a mellow spicy kick, but I did not quite enjoy it because it was overly oily and salty. We wanted vegetables...yes, the fat couple was craving for greens. We were hoping to get some kind of leafy greens but the restaurant only offered one type of veggie, Broccoli with Oyster Sauce 蚝油美芥兰. 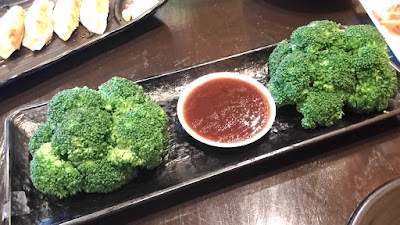 Well, nothing much to mention about blanched broccoli with salty oyster sauce for dipping. After seeing all the small portions, I decided to add two more dishes. 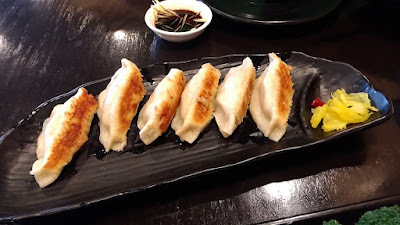 The first was the Pork & Shrimp Dumplings 猪肉三鲜水饺. These handmade dumplings had thicker skin wraps than the wontons, which they should be. Similar to other dough products we've tried, the wraps maintained its chewy consistency. The stuffing was mainly pork, vegetables and limited amount of shrimps. What we didn't like about the mix was the overuse of sesame oil, which embedded that oily fragrance in our mouths for a while. 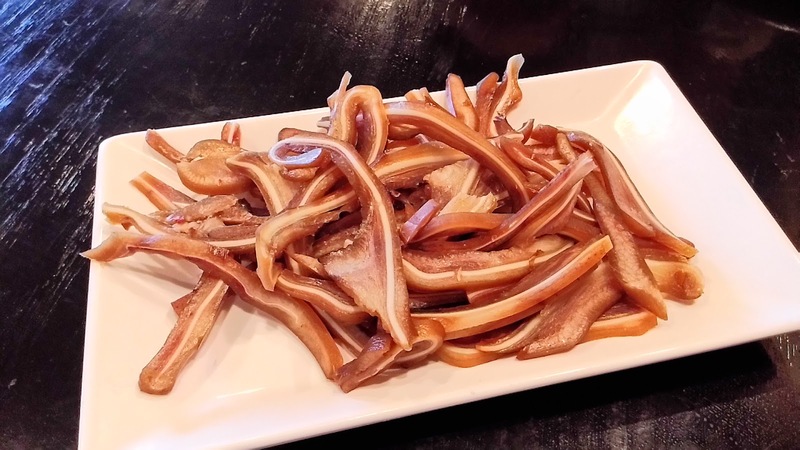 The second dish I added was the Pork Ear 卤猪耳. 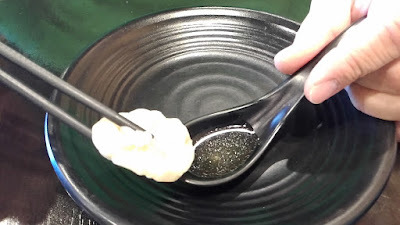 The ears needed to be cooked a bit longer to reach that necessary soft yet crisp texture. Flavor-wise, it lacked that scent and spice of a classic herbal soy-marinate. Not recommended. 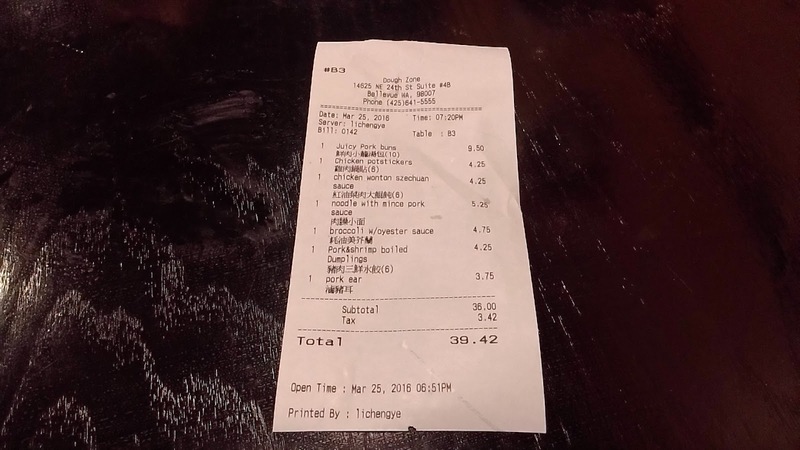 Our courteous young male server was quite efficient; empty plates on our table were collected quickly and our water glasses were filled frequently. The only complaint I would have was the group of young Mainland Mandarin-speaking servers constantly hanging out at the busing station next to us chatting, giggling and swearing (in Mandarin).